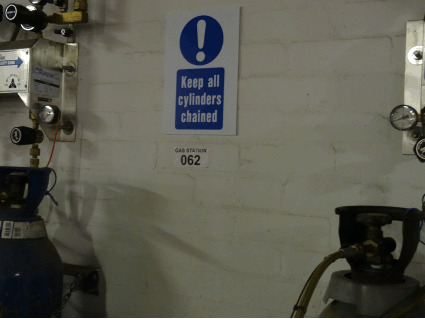 Use these storage signs for gases under pressure to clearly identify designated areas to safely stock and handle your gas cylinders. Use in well ventilated areas, away from heat, sources of ignition or flammable materials, well clear of any potential impact (ie fork lift trucks). Signs include areas for cylinder storage as well as separate areas for full or empty cylinders, and are available in self adhesive vinyl and rigid plastic. We also supply Gas Cyclinder Tags. Gas cylinder storage safety symbol and text sign. Caution compressed gas symbol and text safety sign. Caution propane symbol and text safety sign. Danger Compressed gas, mini safety sign. Full cylinder storage area symbol and text sign. Empty cylinder storage area symbol and text sign. Explosive atmosphere hazard symbol safety sign. Caution LPG highly flammable symbol and text safety sign. Caution highly flammable gases symbol and text safety sign. Caution oxygen cylinder symbol and text safety sign. Caution explosive gas symbol and text safety sign. Caution acetylene cylinder symbol and text safety sign. Keep all cylinders chained symbol and text sign. Cylinder storage area symbol and text sign. Petroleum spirit highly flammable, no smoking or naked flames safety sign. Caution highly flammable symbol and text safety sign. Pressurised cylinder hazard warning symbol label. Caution Explosive atmosphere symbol and text safety sign. LPG cylinder storage area symbol and text sign.